"His songs ring true with a West Coast Country cadence . . .
the rich tone draws the listener in." 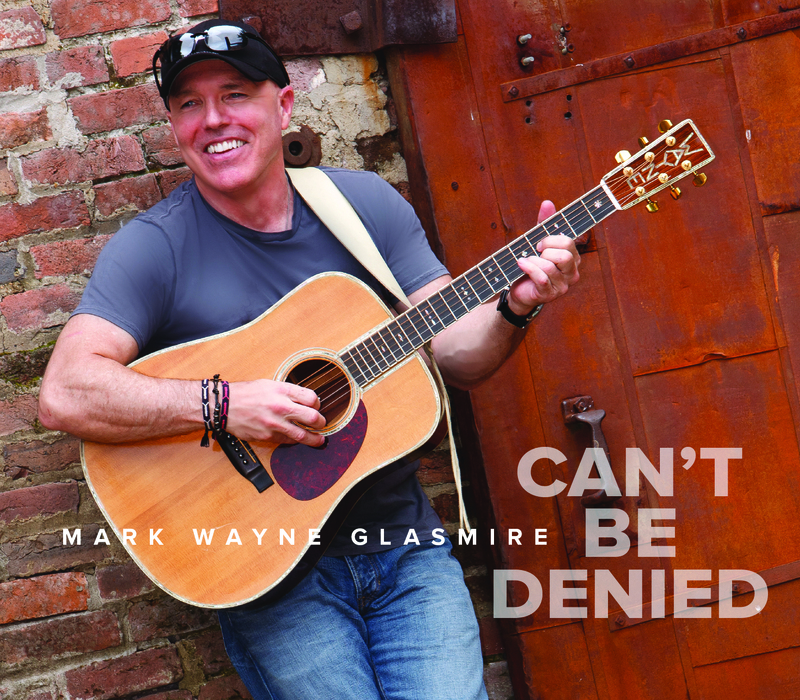 Nashville, TN (August 30, 2018) - The broad appeal of award-winning singer/songwriter Mark Wayne Glasmire CAN'T BE DENIED, and the proof is found in this upcoming 12-track collection, which drops October 12. Available for pre-order now at Amazon and CD Baby and co-produced by Glasmire and John Albani (Steve Azar, Monty Holmes, Randy Boudreaux), the album reflects Mark's evolution as a writer and spotlights the purity of his voice as well as his talent for creating melodic magic. While not a concept album, CAN'T BE DENIED focuses on love in many of its diverse manifestations. In Glasmire's world, love molds us, changes us, tempers us, challenges us and rewards us. Love is all. The disc opens with its first single release, the mid-tempo "I've Got A Feeling." Banjo, fiddle, B-3 vamps and a mind-hijacking, sing-along chorus make this exploration of love at first sight an upbeat return to the airwaves for the Pennsylvania native. A companion music video premiered yesterday on Center Stage Magazine, was spotlighted on Roughstock, and has been added to the international Hotdisc Top 20 TV show. Delivered to radio programmers via PLAY MPE, the track is available for download from AirPlay Direct. "Those Nights," acknowledges the importance of a loved one's support as we reach for the stars, while the title track rhapsodizes on déjà vu and Fate. From the sweet, orchestrally-enhanced "Without You," to the sassy, joyous abandon of "Alysia," Glasmire captures moments in time and spins them into emotionally-accessible odes to love. "Borderline" is the only outlier here, but the dramatic Outlaw feel circles back thematically as a dying gunman reunites with loved ones who've gone before him. "Feel Your Love" grabs the listener with its desperate need, while loss and regret are the targets of "Gone Too Soon" and the haunting "This Too Shall Pass." "Deep Inside My Heart" ups the tempo - and the ante - in a barn burner to inevitability as "Out Of The Frying Pan" outlines the dangers found in loving too many too well. The album closes with "Thru My Eyes," a raw assessment of the lingering damages caused by dysfunctional familial love - and the hope that things will someday change. As Fervor Coulee's Donald Teplyske noted recently,Glasmire's sound is hard to categorize. To describe it as a mix of the " . . . breezy '70s sounds like Seals, England Dan, Loggins, Crofts, Messina, John Ford Coley," combined with influences of The Eagles and Country two-steppers and the ". . . poetic approach of Guy, Townes, Lyle, Gary P.," charged with a dose of "rock 'n' roll verve" doesn't do it justice. What CAN'T BE DENIED does is present a wide-ranging album filled with songs that enlighten, entertain and engage, each written - and sung - from the heart. MusicRow Chart and earned international acclaim with a string of #1s. His "I Like You" spent nine weeks in 2012 at the top of the Hotdisc International Chart and solidified his global fan base. He has shared the stage with Gordon Lightfoot, Dierks Bentley, Guy Clark, Kathy Mattea, Tracy Chapman, Jessie Winchester, Al Stewart, Bruce Robison, Rick Vito, Verlon Thompson, Roger McQuinn, Tom Paxton, Suzanne Vega, John Gorka, and more. Glasmire has performed at venues ranging from the CMA Music Fest to intimate night clubs, and he has toured on the national level for years. He has taken home first place honors in the B.W. Stevenson Memorial Songwriting Competition in Dallas, the Dallas Songwriters Association International Songwriting Competition and the GINA/LAWIM Songwriting Competition in Los Angeles, as well as the Grand Prize in the Country Song division of the 2010 Chris Austin Songwriting Contest at Merlefest. The Bethlehem, Pennsylvania-born artist now resides in Arlington, Texas.